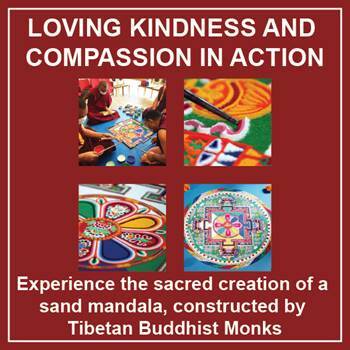 The Denis Hurley Centre is honoured to be hosting the creation of a Buddhist Sand Mandala this weekend from October 14, 2018. This will be an amazing experience as three Tibetan monks in robes laboriously spend seven days chiselling away at coloured rocks to create an intricate spiritual image while praying and chanting. The colours for the painting are made with naturally coloured sand, crushed gypsum (white), yellow ochre, red sandstone, charcoal, and a mixture of charcoal and gypsum (blue). Mixing red and black can make brown, red and white make pink. Other colouring agents include corn meal, flower pollen, or powdered roots and bark. The monks will be travelling with companions from Tibet who will be on hand to explain more about the religion and culture of Tibet. There will also be an opportunity for people to buy Tibetan products and to colour in their own mandalas. Janet Talbot, education specialist working with the DHC added: “This is a wonderful experience for school learners to see – and a chance to teach them about (among other things): Religious art, Eastern religions, Spiritual healing and even Chinese politics!